"I've been called Uncle Tom, sellout, an Oreo. It's not about Allen West. So once again, it's very interesting to me that we continually allow liberals to do whatever they want in attacking conservatives but all of a sudden, when a conservative stands up and says enough, then people want to sit back especially liberals want to play victim. She's not a victim. 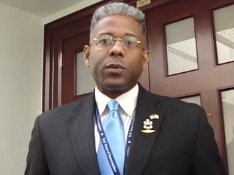 She's been attacking Allen West for quite some time," Rep. Allen West (R-FL) told FOX News. WH's Carney: "Leadership Is Not Proposing A Plan"